The origins of the bagpipe can be traced back to the most ancient civilizations. The bagpipe probably originated as a rustic instrument in many cultures because a herdsman had the necessary materials at hand: a goat or sheep skin and a reed pipe. The instrument is mentioned in the Bible, and historians believe that it originated in Sumaria. Through Celtic migration it was introduced to Persia and India, and subsequently to Greece and Rome. In fact, a Roman historian of the first century wrote that the Emporer Nero knew how to play the pipe with his mouth and the bag thrust under his arm. During the Middle Ages, however, the bagpipe was heard and appreciated by all levels of society. 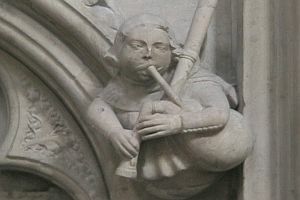 Bagpipes have always been made in many shapes and sizes, and have been played throughout Europe from before the Norman Conquest until the present day. Medieval pipes usually had a single drone - see contemporary illustrations of Chaucer's Canterbury Tales for English single-drone pipes. Around 1400 (give or take 50 years), most shepherd-style pipes acquired a second drone. A third drone is added about after 1550. See paintings by Brueghel and the illustrations in Praetorius' Syntagma Musicum. The Renaissance also saw the advent of small, quiet chamber pipes such as Praetorius' Hummelchen or the French shuttle-drone models, some blown with bellows under the arm rather than with the mouth. The construction of the bagpipe allows a continuous supply of air to be maintained. By squeezing the bag with his left hand while a breath is taken, the flow of air can be kept up in both the drone pipes and chanter. Other features of this instrument are the mouthpipe and the double reed of the chanter and drone. The mouthpipe contains a round piece of leather hinged onto the bag end which acts as a one way valve. As the player blows air in, the flap opens; when he stops blowing the air pressure within the bag forces the flap shut. 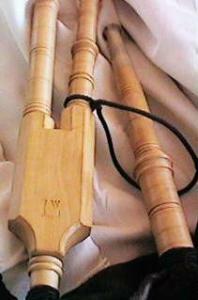 The chanter has seven finger holes and a thumb hole, and has a usual range of an octave and one note. 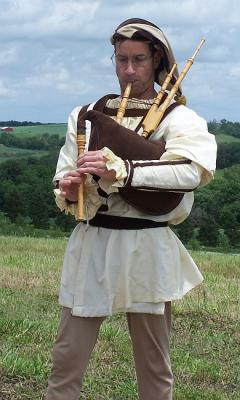 The bagpipe is ideal for solo dances and monophonic music. It has been mentioned for use in polyphony, but if so, problems would arise. The drone would preclude the possibility of any change of mode, and the continuous sound would prohibit observance of rests. During the Renaissance, the bagpipe gradually moved from country to court. Both Edward II and Edward III had pipers at court. King Henry VIII, composer and music patron, also had an extensive collection of instruments which, according to a contemporary account, included wone with pipes of ivorie and a bagge covered with purple vellat. As a rustic instrument it has been immortalized in the paintings of Pieter Breughel and his contemporaries. Musica Antiqua's collection includes a replica with two drones patterned after Brueghel's Peasant Wedding, and a Hummelchen (little bumblebee) bagpipe which is modelled after the smallest of the four included in Praetorius' Syntagma Musicum of 1619. The Brueghel model is smaller than a highland pipe and loud, but not as piercing as a today's highland pipes. The Praetorius model is tiny and has sweet and delicate tone, making it useful both as a solo instrument and in ensemble with other Renaissance instruments. The chanter has a range from c1 to d2 and two drones tuneable to f and c or g and d. This boxwood replica was made by Wolfgang Lentelme of Germany.